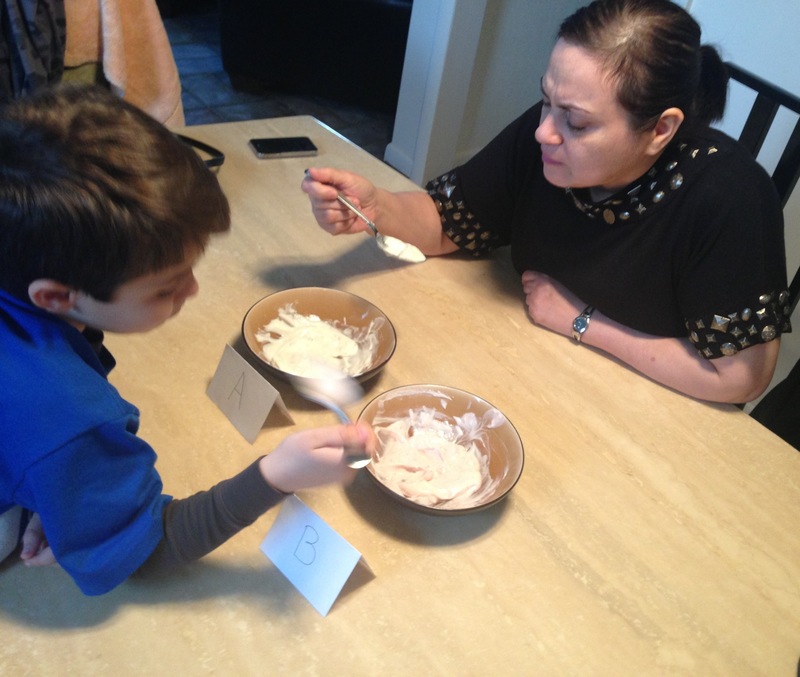 Consumers across America participated in a national yogurt taste test and results showed that 4 out of 5 people thought that Yoplait Greek 100 Strawberry tastes better than Chobani Simply 100 Strawberry. I decided to host my own taste-off & see what my family preferred. 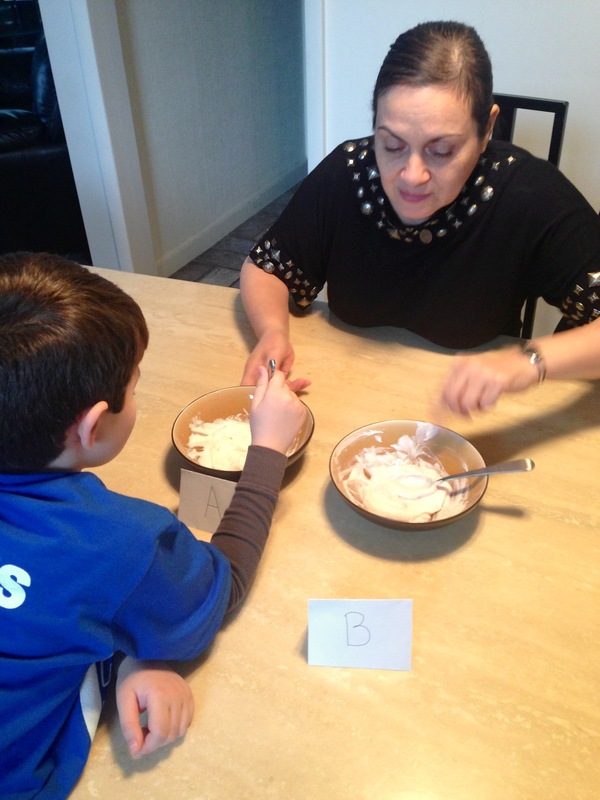 On the first day of the taste-off, I had my mom & nephew join me. I set out 2 different bowls labeled A & B so they wouldn’t know which brand they were trying. 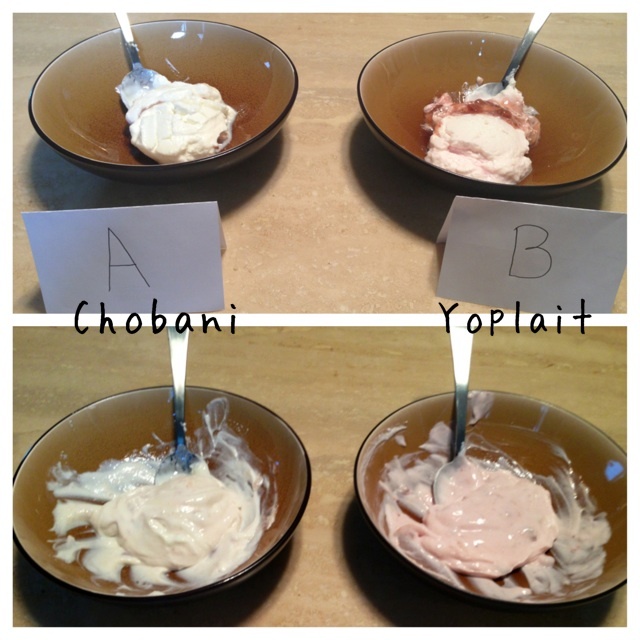 [ A ] was Chobani & [ B ] was Yoplait. 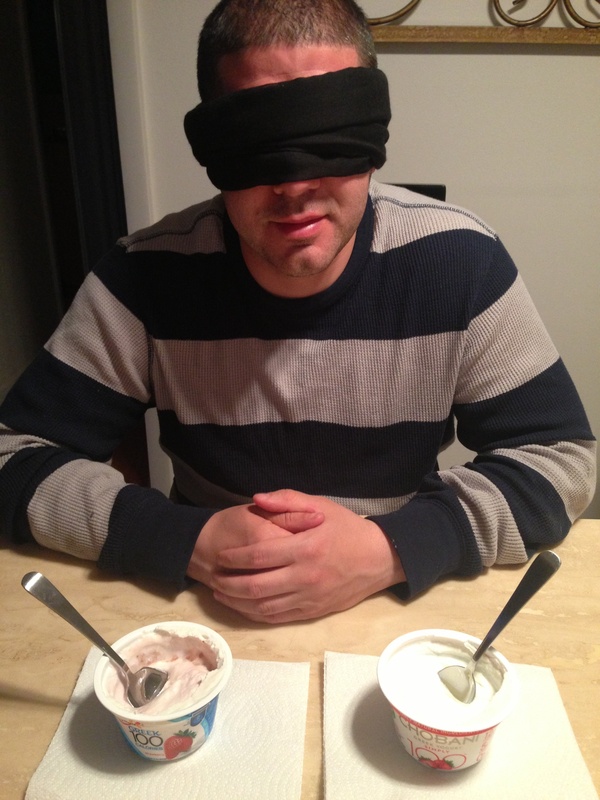 As you can see from the picture above – when the Chobani was mixed with the fruit, the color stayed the same. 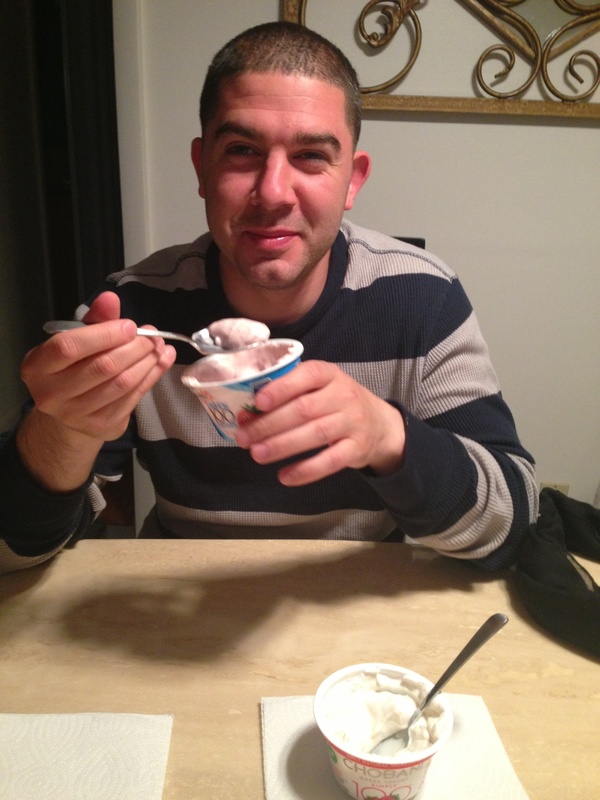 When I mixed the Yoplait Greek 100 Strawberry, it became a beautiful pink color. 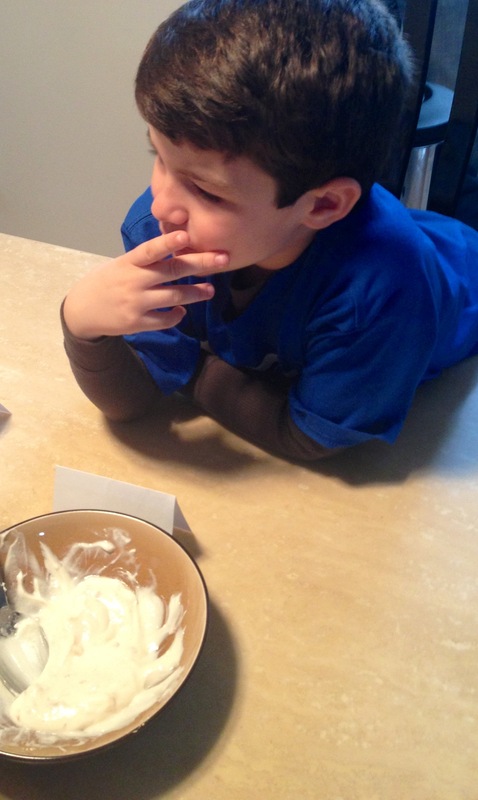 Hmm… looks like someone didn’t enjoy the first taste. I then had my fiancé try them. 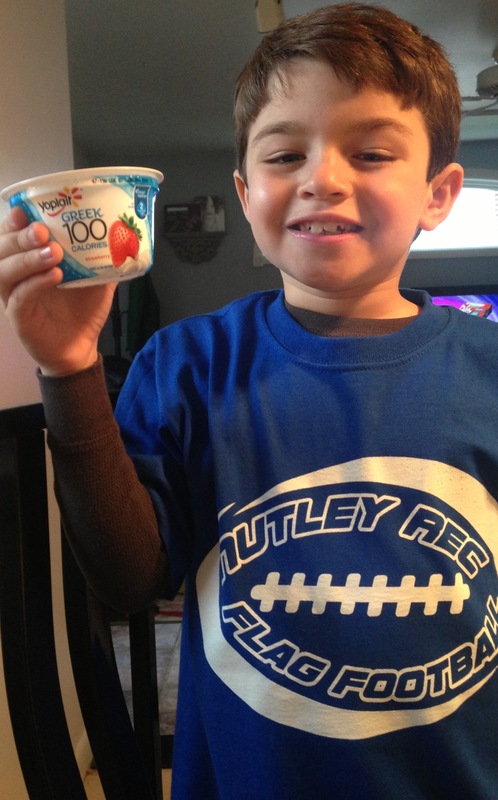 AND THE WINNER OF THE TASTE-OFF IS…..
Yoplait Greek 100 Strawberry Yogurt! All 3 of them felt like the Chobani Simply 100 Strawberry was pretty bland and bitter. 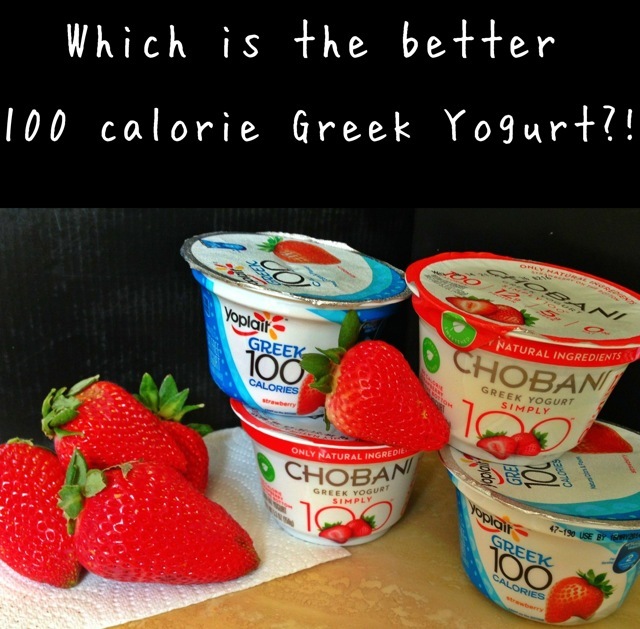 The Yoplait Greek 100 calorie yogurts have just that – 100 calories for the whole cup and are available in 12 delicious flavors! Strawberry, Blueberry, Black Cherry, Strawberry Banana, Vanilla, Peach, Key Lime, Lemon, Mixed Fruit, Tropical, Apple Pie, & Strawberry Cheesecake. 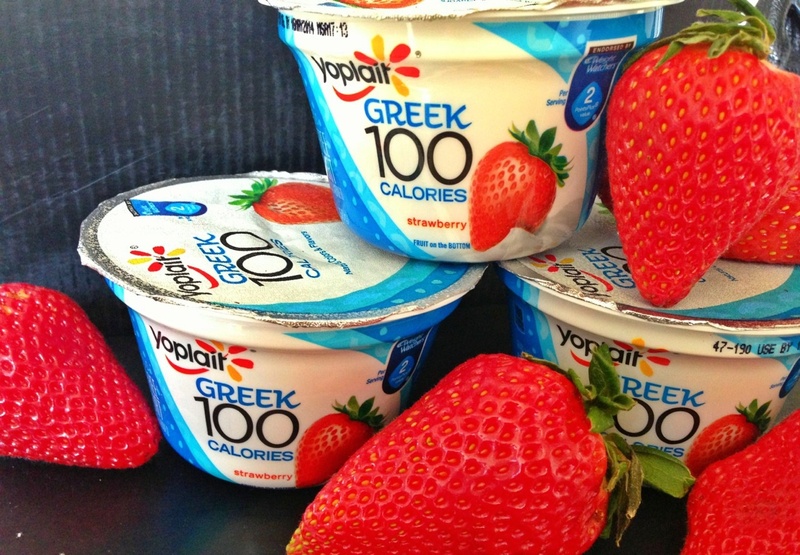 To find Yoplait Greek 100 nearest you – click HERE. 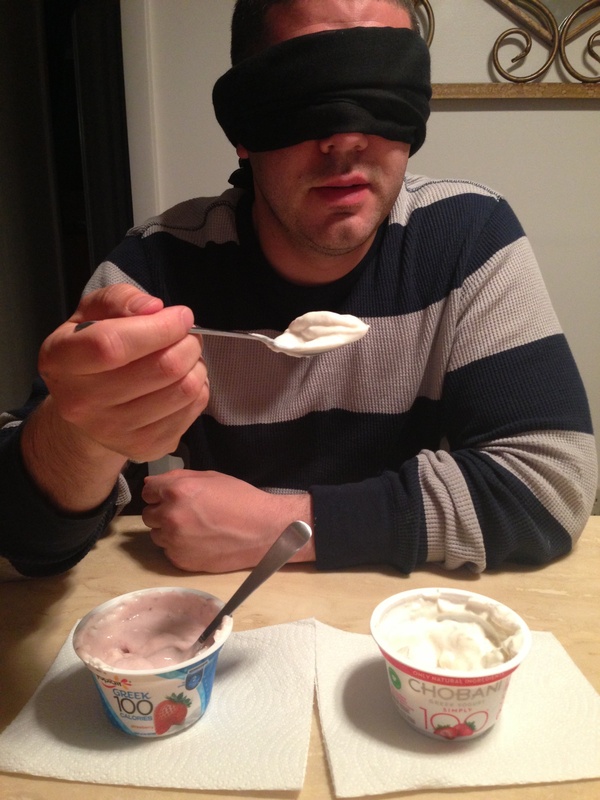 I’ve taken the Yoplait Taste-Off, now it’s your turn! Let me know who won your taste off! 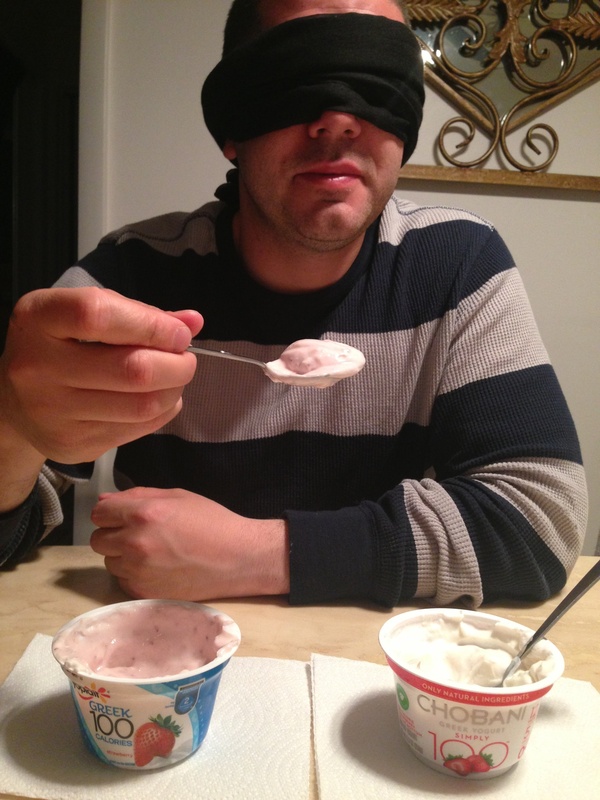 I want to thank Yoplait for sponsoring today’s #Tasteoff, and giving me the opportunity to openly express my honest opinion. 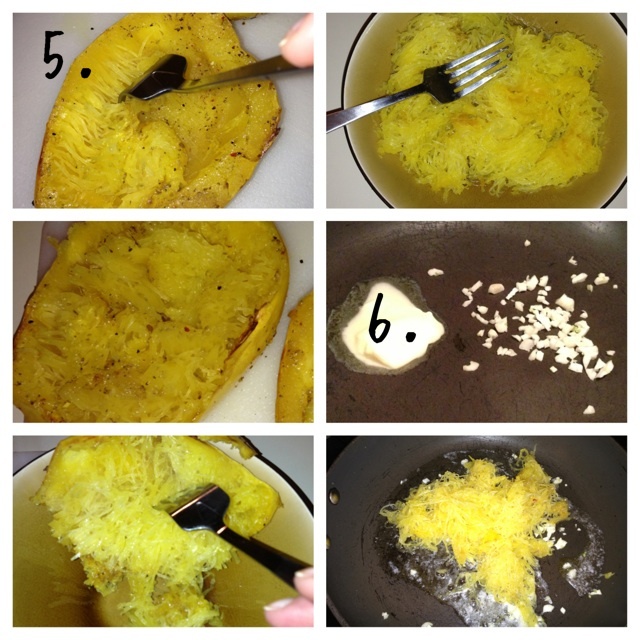 When I first heard of Spaghetti Squash – I just didn’t get it! I didn’t even know if I liked Squash but the thought of using a vegetable (some would argue that it’s technically a fruit) as a pasta substitute baffled me. Could anything be as delicious as regular, carb filled pasta?? 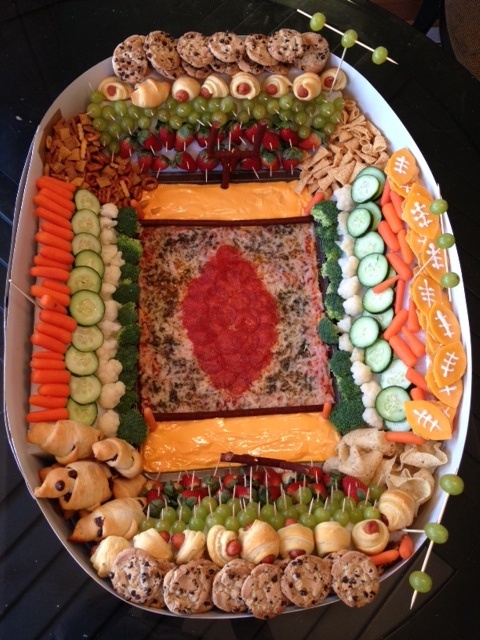 Not only does it look amazing but it taste DELICIOUS! I was really surprised by the texture and I plan to start incorporating Spaghetti Squash into my weekly dinners more often. 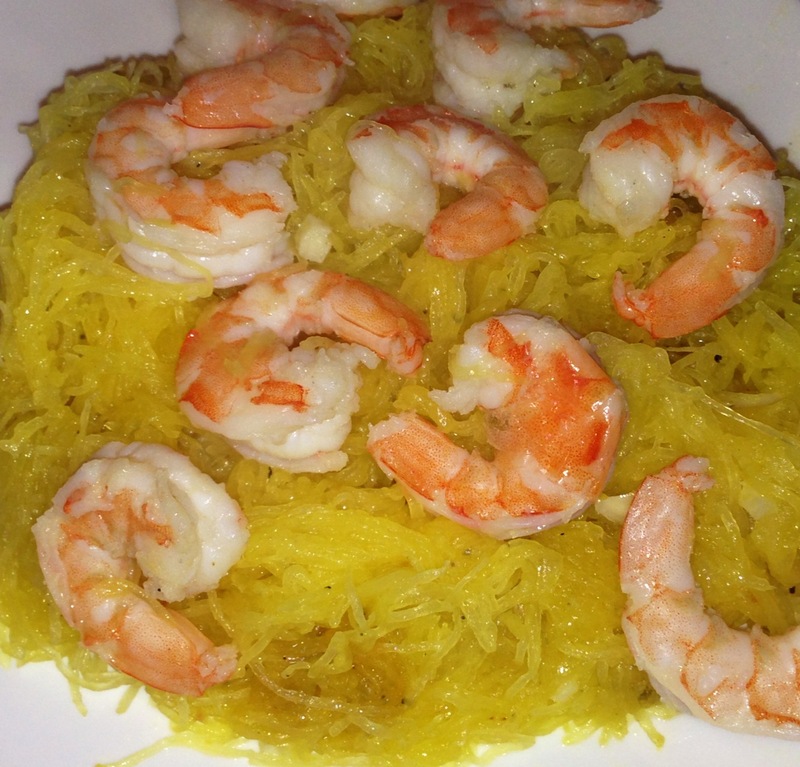 Anytime I work with recipes I find online, I always substitute ingredients & put my own spin on it so here is the recipe I used to make my Spaghetti Squash with Shrimp. 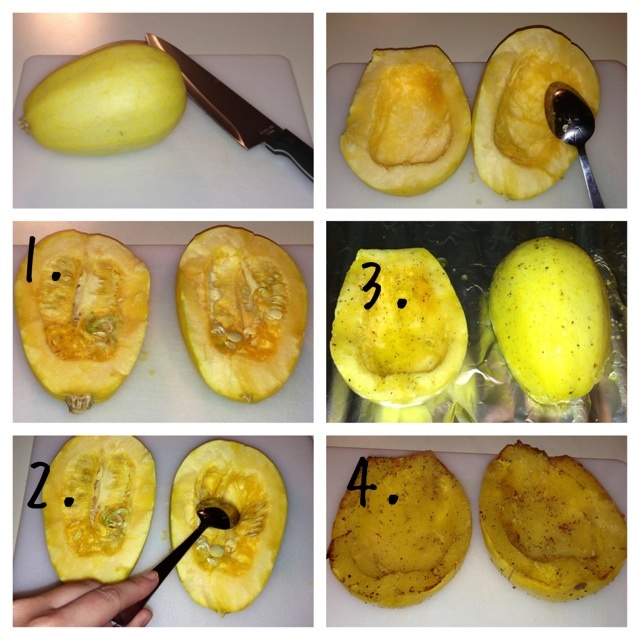 Spaghetti Squash – I used a 2lb squash, but adjust size to the amount of servings you want. 1. Cut your squash in half lengthwise. Be very careful and go slow as it is not easy to slice. 3. Preheat your oven to 375 °F. 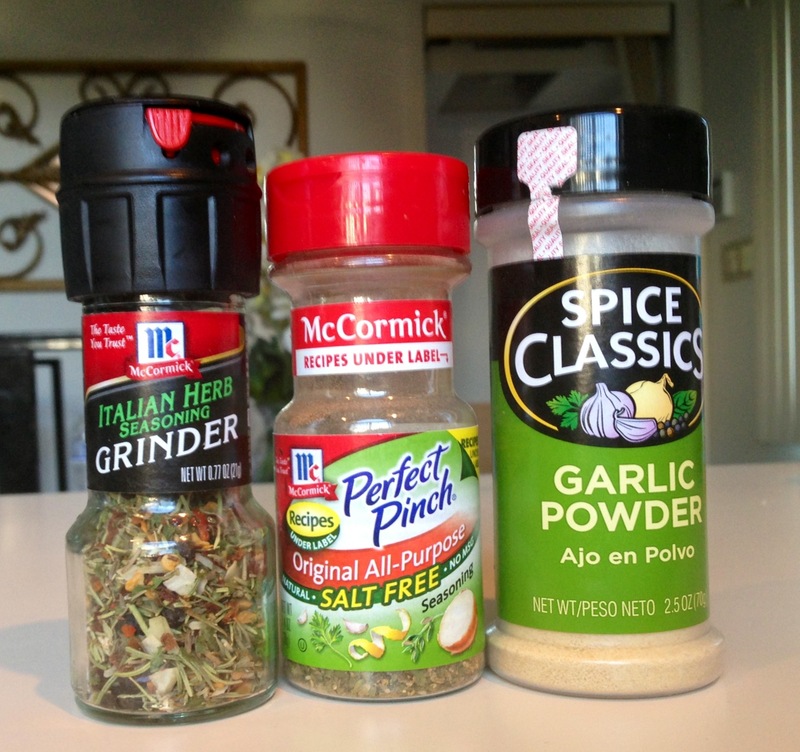 Take your olive oil, sea salt, black pepper & herbs and mix them together in a bowl. Using a pastry brush or spoon, brush both sides (top & bottom) of your squash generously and place them on your baking sheet with the opening facing down. 4. Bake for 40 minutes – if you have a larger squash, you might want to bake for an additional 5-10 minutes. When I removed the squash, my top was browned. *Taste the noodles. Feel free to skip the remaining steps if you are satisfied with the taste & do not want to add extra calories with the butter or add shrimp. The taste of the spaghetti with the mixture of the olive oil with salt, pepper & herbs is delicious as is. 6. 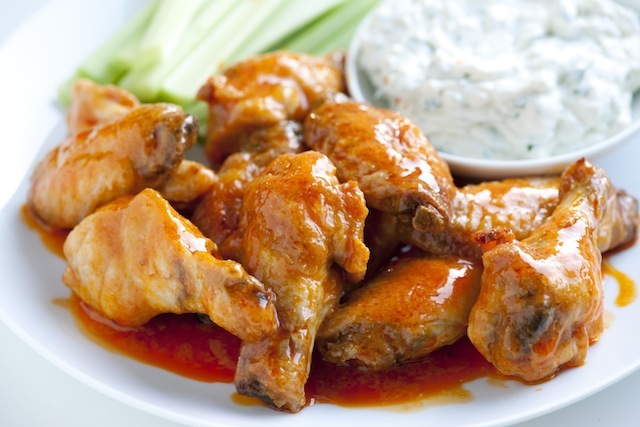 Heat a pan with garlic and butter – use as much or as little as you would like. Toss in the spaghetti squash and mix for about 2 minutes so it soaks up the butter and garlic then plate. 7. These particular shrimp were already cooked so I just let them sit in room temp water and after I removed the spaghetti squash from the pan, I threw the shrimp in to catch some of the butter & garlic flavor and topped them on to the spaghetti. I was surprised at what an easy meal this turned out to be. Next week I will be trying it with a meat sauce but there are endless amounts of possibilities when cooking with Spaghetti Squash. 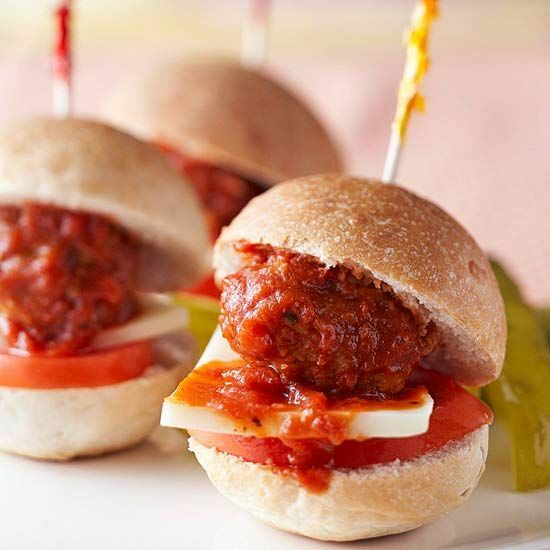 Here are a few other recipes that caught my eye. One of the major pluses of Social Media to me is the power of sharing. 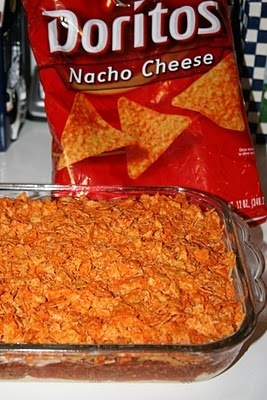 I have come across some of the BEST recipes on pinterest and facebook and when I saw this one I knew I had to share. Seriously… who doesn’t love Nutella??? 8. 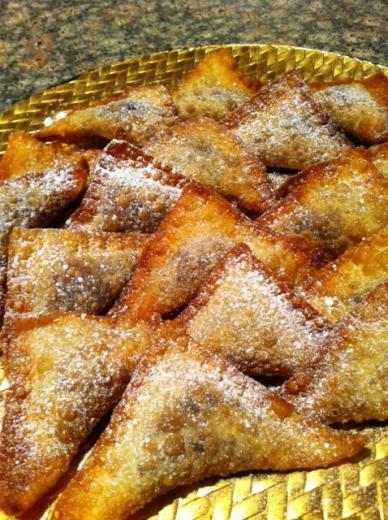 Drain on a paper towel, then sprinkle with powdered sugar and eat immediately!! I wanted to share with you guys my FAVORITE meal to cook during the week. 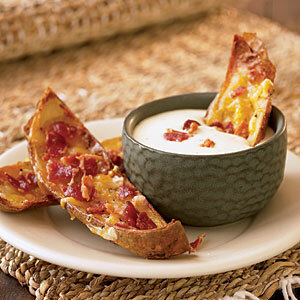 Not only is it a quick & easy meal to whip up… it’s also DELICIOUS!!! 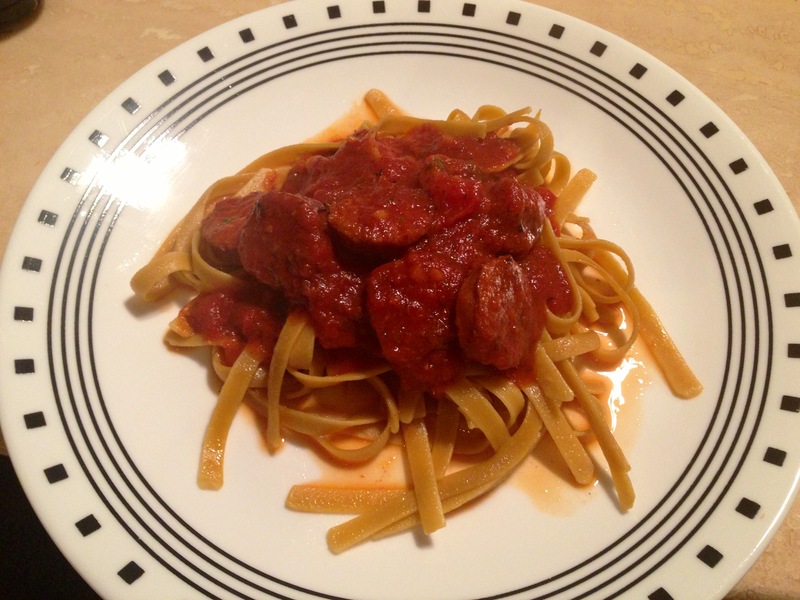 You have to start off with a package of sausage and a box of pasta. My sausage of choice is usually Premio and while I normally get the mixed (Hot & Sweet) package – today we are working with only hot. 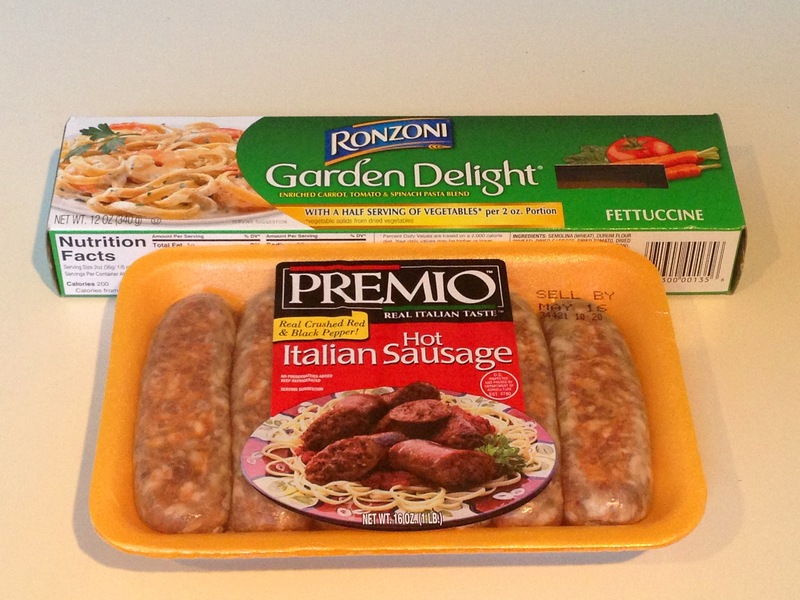 My favorite pasta is the Ronzoni Garden Delights! I couldn’t even tell you the last time I cooked with regular pasta. 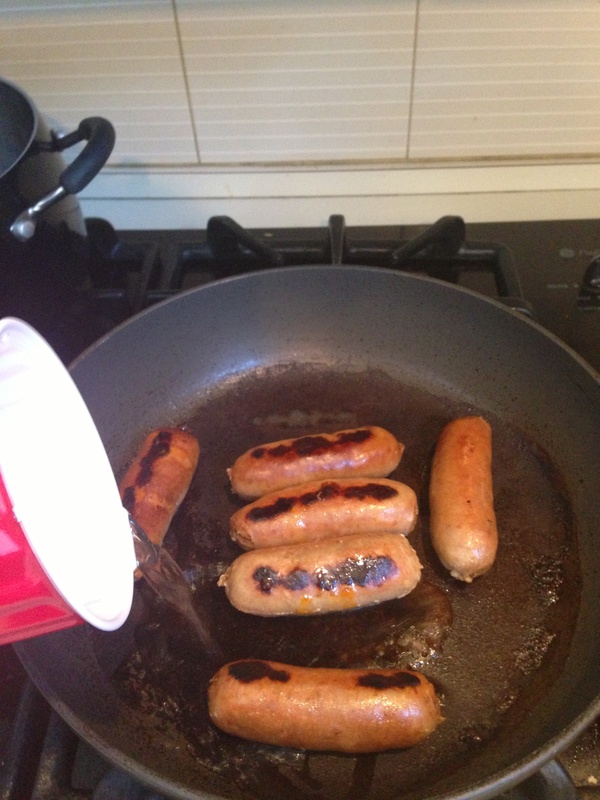 I put a large pot of water to boil and then place all the sausage links in a pan with a little water and cover it with aluminum foil. 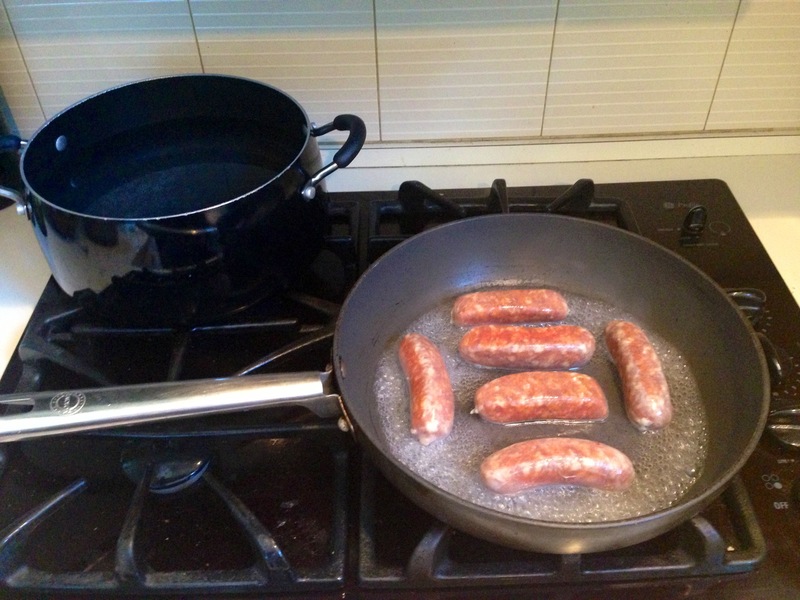 I love to really brown my sausage because it brings out a lot of flavor into the pan. 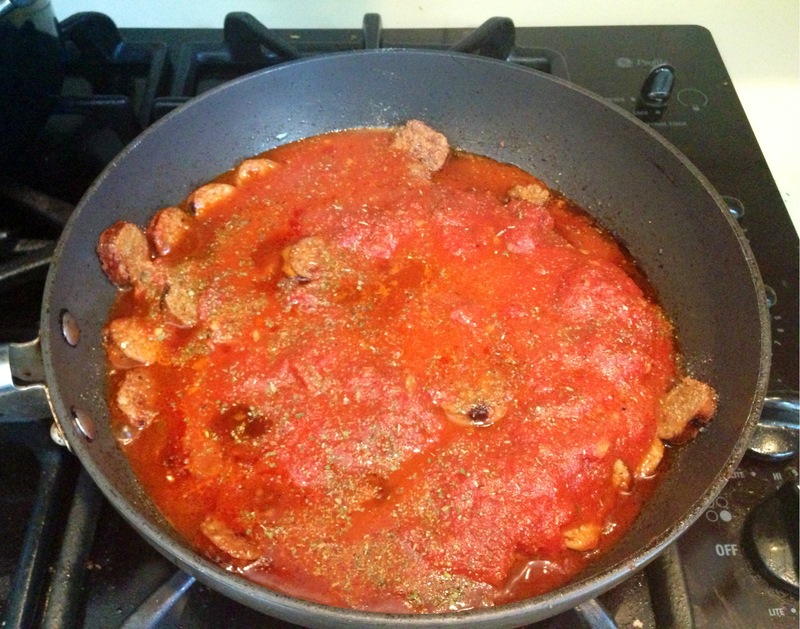 I flip the sausage and add a little more water and re cover. By this time, the water is boiling so I toss in my pasta. 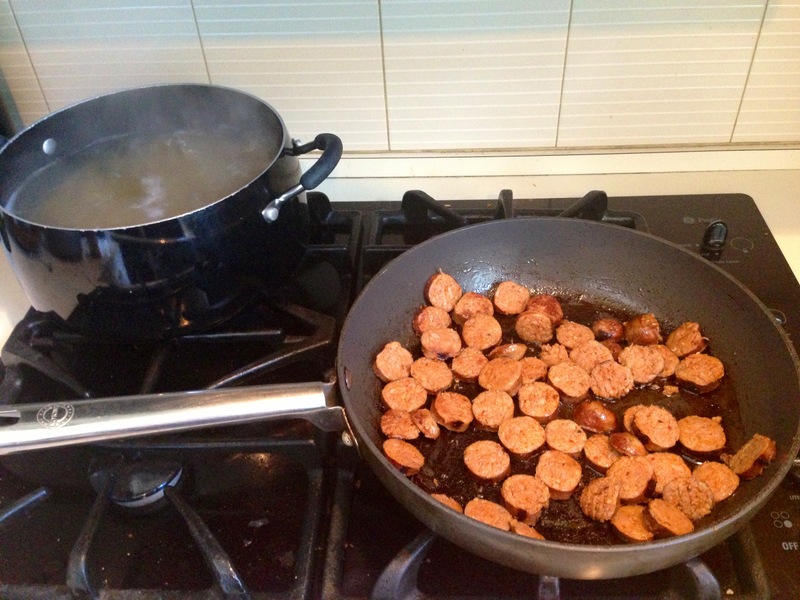 I then remove the sausage from the pan and slice them and throw them back in for some more browning at a very low temperature. A lot of people cringe at store-bought sauce but guess what? 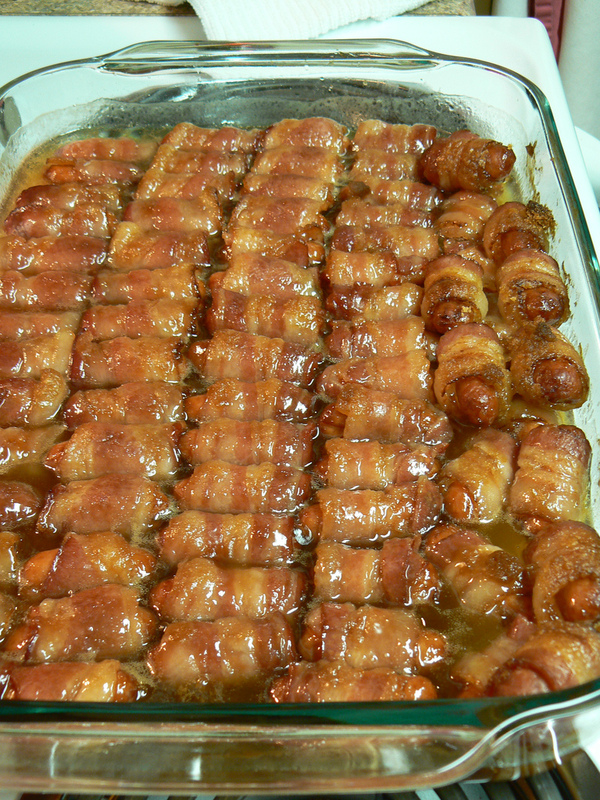 I don’t care… my family doesn’t make it homemade and so I’ve had to perfect my favorite one from the grocery store. 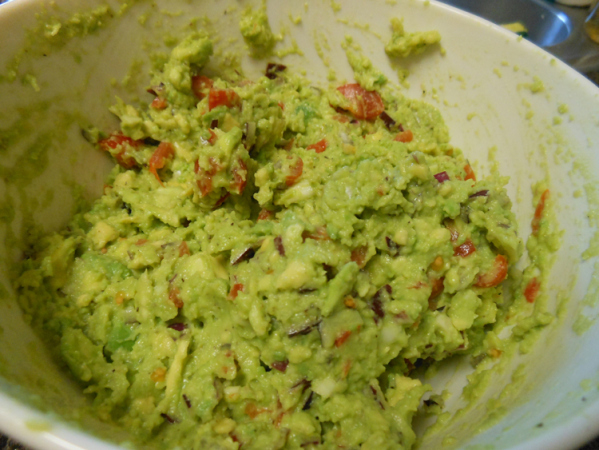 Your family will be begging you to make this dish again soon. I personally am not a big fan of chunks of tomatoes or onions (already in the jar) so I throw the sauce in the blender to chop those pieces up. I then pour the sauce over the sliced sausage (fill up the empty jar 1/2 way with water, shake and pour that in as well) and throw in these seasons on top to taste and stir. I think quick meals should be about convenience so if you do not have some of these — skip them or substitute. Cover pan and let it simmer for a few minutes. 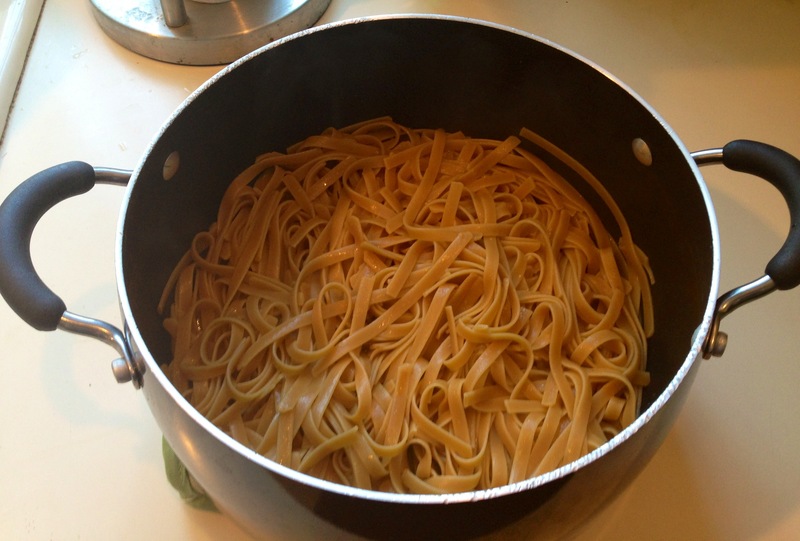 Remove pasta from the stove and drain. I always add a touch of olive oil or butter to keep pasta from sticking together. 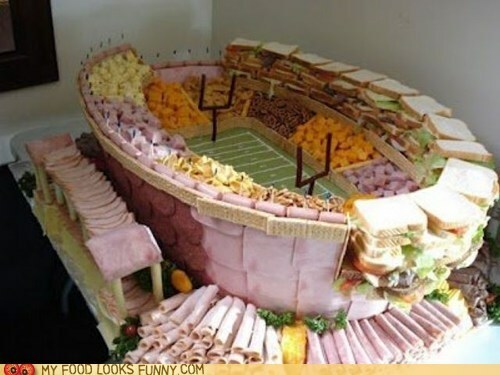 That’s it… now dinner is served! 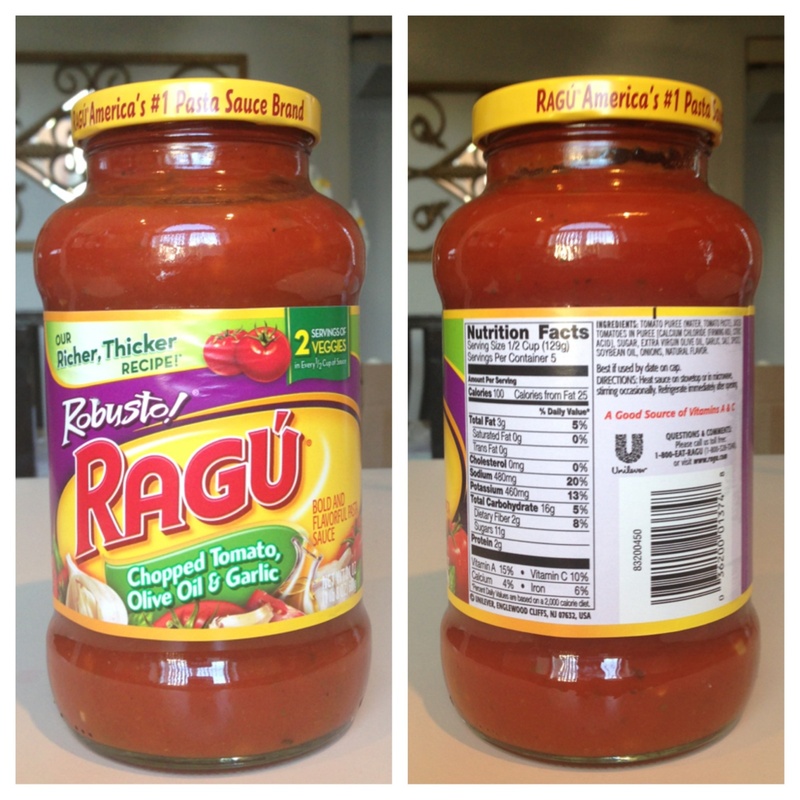 Quick tip: when storing left overs, keep the sauce with sausage and pasta in 2 separate containers.